Sittingbourne Viaduct station is on the site of the former transfer sidings, trains from Ridham Dock and Kemsley Paper Mill would arrive here and be split for various destinations around the paper mill and wharf. Some wagons are based here to give a flavour of this formerly busy location. Unfortunately, the site suffers from vandalism and so we have very few facilities – a ticket office and waiting shelter being the full complement. The original mess room and ticket office buildings were both burnt down in 2013 and 2014 respectively. We have plans for disabled access, improved security and electricity but this all costs a lot of money – see our fundraising page. The paper mill used to be located on what is now Morrisons and its car park & petrol station. The last remaining part of the mill (other than the Railway!) is the short bridge over The Wall (the entrance road to the station) at the end of our site. This used to carry trains into the mill from both the transfer sidings and the wharf. The bare remains of the wharf can be seen below our site, at the end of Milton Creek. Eventually, some of this area will become a Skatepark. The present Sittingbourne Retail Park used to be warehouses and even an engine shed existed here but this is all long gone. In 2015, a mural was painted on The Wall representing many scenes from the past in the Sittingbourne Wharf area. 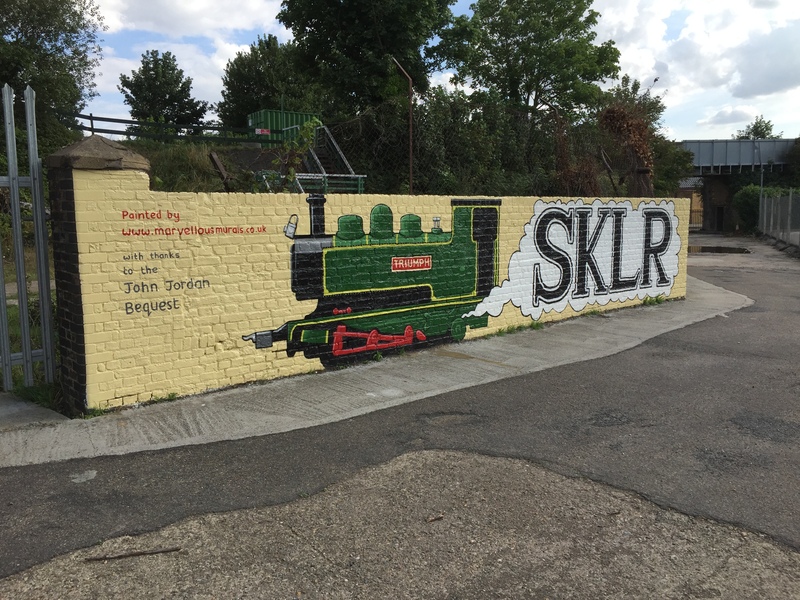 The mural was painted by Dean Tweedy of Marvellous Murals with thanks to the John Jordan Bequest and The Sittingbourne Society. The track out of the platform is on a steep incline so the steam locomotive will make lots of noise pulling the train up onto the first bridge, it may even slip if the rails are wet or greasy. The bridge over The Wall indicates the start of the kilometre-long Milton Regis Viaduct, which turned 100 years old in 2015. The train travels slowly over the Viaduct and its 118 spans and 5 bridges, giving a unique perspective of the area. Originally the Viaduct crossed several roads and weaved between terraced housing and Milton Creek forming this strange, curvy route out of town! The last section of viaduct is straight and leads onto a high embankment where the only intermediate station can be found – Milton Regis (Asda) Halt. This station is accessed through a gate from the car park of Asda but has been closed since late 2012 due to severe vandalism. This area used to be the location of Midway Sidings, where trains would wait their turn to cross the Viaduct to Sittingbourne. Short trains hauled by the smaller locomotives were connected together here for bigger locos to take them onwards to Kemsley Mill or Ridham Dock. Another straight section follows, where on the right hand side of the line a pipeline can be seen running in parallel with the Railway. You will have seen it alongside the train for most of the journey so far. The pipeline used to carry high pressure steam from the power station at Kemsley Mill to Sittingbourne Mill to run the machinery, hot water and effluent would return in adjacent pipes. A more recent and now scrapped pipeline used to be carried on the concrete bases that also follow the line. A pipe bridge appears for no obvious reason just as the train slows for One Mile Bend, this was Council Crossing and accessed the former tip (now a household waste and recycling centre). One Mile Bend is a sharp left curve and leads the Railway through Milton Creek Country Park, but more on that later. The train will slow down for Burley Crossing. There are two pipe bridges here, the first used to cross a branch line to Burley’s Wharf on Milton Creek and the second is Burley Crossing, a former brickfield line. There is a short stretch of straight track as we approach the Northern Relief Road Bridge, now called Swale Way, this is a great vantage point for photographers wanting to get a picture of the train passing through the countryside or with Kemsley Paper Mill as a backdrop. The line then forms a barrier between the saltwater marshes on the right and the freshwater marshes on the left and attracts different species of birds and insects. 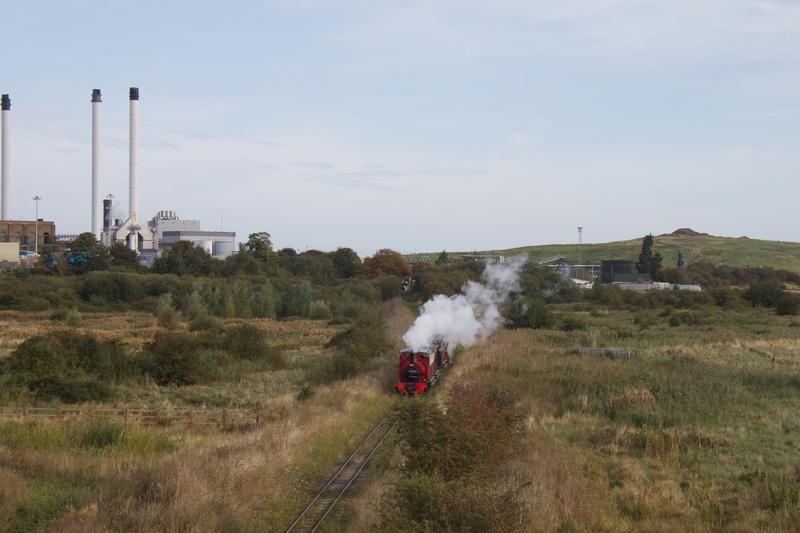 We round the last corner before Kemsley Down, Kemsley Paper Mill really looms over the train to the left. The driver will use the locomotive’s whistle on approach to the station and must stop before the ‘end of single line’ board if the signal is at danger. When the signal is cleared for entry into the station, the train will proceed into Platform 1 at Kemsley Down, crossing the other level crossing which is used for internal paper mill traffic. Kemsley Down – where all the action is! On arrival at Kemsley Down station, our main site, you will find two standard gauge steam locomotives (Bear and No.1) at the end of the platform, exit the platform here and follow the path straight ahead. Museum Walk is to our left but we’ll carry on ahead for now. Throughout 2019 there will be road improvement works being carried out adjacent to Kemsley Down station so it may be necessary at times for trucks to cross our site, this may also cause the road through our site to be uneven. The scale of change at Kemsley Down is not always obvious but the photos above show the difference between September 2012 and October 2018 with the construction of a massive incinerator behind our site. The Engine Shed is on our left, the big, grey structure, please don’t enter it unless you’re on a guided tour (ask a member of staff, we are sure someone can show you around!). On the right is the wishing well and the Memorial Garden. This is an area for reflection and is dedicated to the memory of our members who are sadly no longer with us. Ahead is the toilet block, picnic & play area and Footplate Café, where you can buy hot and cold drinks, light meals, sandwiches, sweets, ice creams etc. Try our famous sausage rolls! This area overlooks Milton Creek, you can see across to the Conyer bank and out into the Swale Estuary and the Isle of Sheppey beyond. Due to its proximity to Elmley Marshes Bird Reserve, you may also see some unusual birds! In 2017, we hope to open a new 5 inch gauge ride on railway along the creek-side fence line to provide another attraction for visitors to the Railway. The Railway Shop can be found at the rear of the Engine Shed, it stocks a wide selection of toys and gifts including a range of Thomas the Tank Engine, Ivor the Engine, Jack the Station Cat and the Railway’s very own Edward Bear books. We can also order books, toys and gifts so if there’s something specific you want and we don’t stock it, ask the sales staff and we’ll try to get it for you! Let’s head back to Museum Walk, it crosses the track on the approach to the Engine Shed, opposite the standard gauge locos. Museum Walk is the footpath between Platform 2 and the Carriage & Wagon Sidings, one of which has a variety of historic wagons from the Railway’s operational days which would have carried everything from pulp to china clay, coal or rubbish. Keep an eye out for little four-wheel tipper wagons, these came from the construction of the Victoria Line on London Underground. There is a ramp at the end of Museum Walk which takes you to our award winning wildlife garden where you can see the insect hotel and stag beetle area etc. If you’re really still and quiet you may see a lizard, a swallow or even a fox! Also here, you will find fireless steam locomotive Unique and Superb’s sister locomotive Alpha. In due course, we hope to have a garden railway in this area too. 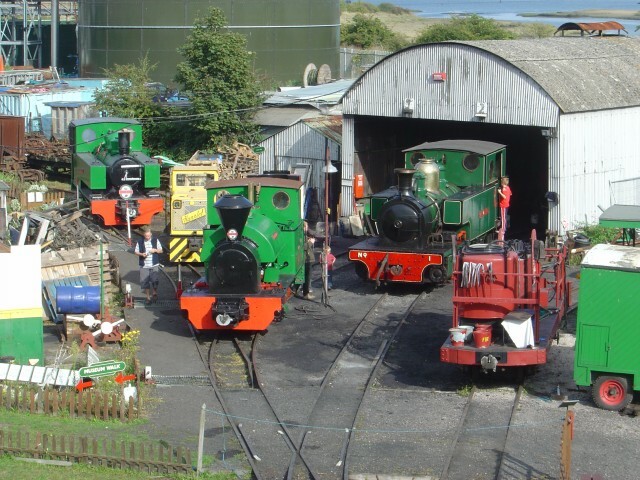 You can get a grandstand view of the engine shed and the platforms here so make sure you’ve got your camera ready – you never know what you’re going to see! There is also a pedestrian gate linking Kemsley Down station to the Saxon Shore Way, turning left heads towards the Swale Estuary and, eventually, Gravesend! Turning right takes you to Milton Creek Country Park (through which the train travels) and Sittingbourne (if you have several days spare you can follow the path all the way to Hastings!). 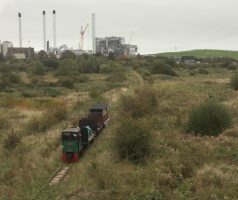 Milton Creek Country Park is well worth a visit and affords different views of the Railway as the trains pass through, visit their website, for more information. We even have a pop-up station for events such as Art in the Park which is held in August. Single fares are available (except during Steam & Beer) so you can walk one way and ride on the train back or vice-versa. 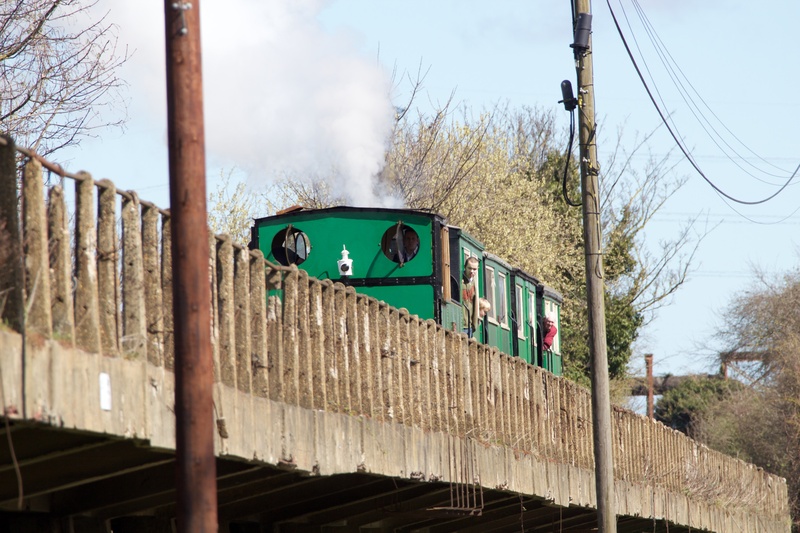 For added entertainment, Kemsley Down also hosts an Easter Egg Hunt on Easter Sunday and a Mouse Hunt during the Jack the Station Cat Weekend. During the latter event, Sittingbourne Viaduct becomes Tail’s End and Kemsley Down is Much Purring! Ivor the Engine can be found having fun here during the August Bank Holiday. 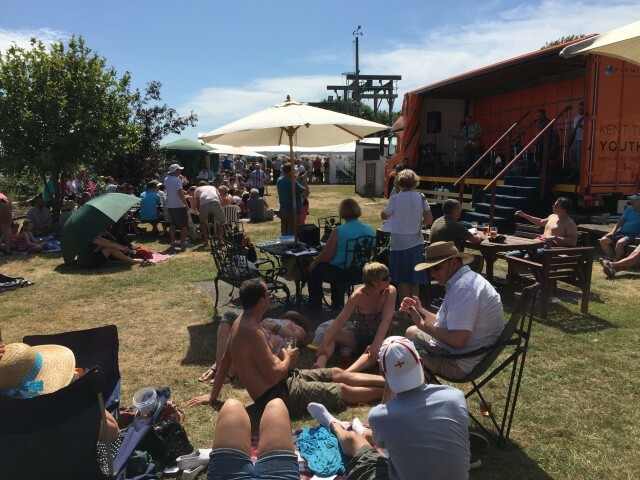 The first weekend in July is our annual Steam & Beer Weekend when Kemsley Down is the location of the beer festival which features a number of unusual real ales and ciders from around the UK. The Saturday is for the serious drinkers, with live music and food available. Trains run until late in the night so it is your only opportunity to experience the Railway in the dark – if you can remember it, that is! Sunday is Family Day so we’ve have enlisted local Johnny Depp look & soundalike, Terry Austin, to entertain everyone as Captain Jack Sparrow from the Pirates of the Caribbean movies. Cap’n Jack is always looking to recruit crew members as well as posing for photos and generally having fun! As you can tell, there’s plenty to see and do at Kemsley Down or you can just sit on the grass and enjoy a picnic and a coffee while the kids have a play!